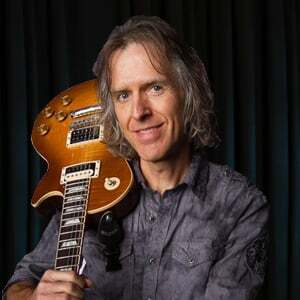 Dave Celentano is one of the industry's hottest and most sought-after guitar instructors, and has been teaching for over 30 years. He has written numerous tutorial books and DVDs for guitar, and released several CDs throughout his career. Dave is proficient in many styles of music including rock, blues, heavy metal, jazz, and classical. His technique specialites include multi-finger tapping, sweep picking, music theory, and reading music. Dave will show you this classic 90’s alternative rock song featuring two electric guitars with loads of grungy distortion, a slow-tempo groove, and layered dynamics. Dave will show you all the parts to this funky rock tune from the monster riffs, to the Hendrix like chorus chords, to the frenzied over the top guitar solos, to the double ending. Dave will show you all the guitar parts to this classic grunge era song. There’s an alternate tuned acoustic guitar that drives the laid back groove of the song. There’s an electric guitar with clean licks, and a brief country/rock major pentatonic solo with grungy distortion. Dave will show you the classical guitar part that consists of sophisticated jazz chords in a sparing way, single notes lines and 6th interval diad lines. There's also an elegant guitar solo and some triads by an overdubbed second guitar. Dave will show you both guitar parts to this song that comes crashing out of the gate with huge riffs and a swaggering swing groove. After a few verses and choruses the song unleashes a blazing solo. Then brings it down dynamically in the Bridge section, before wrapping up with a dramatic finish. Dave will show all the parts to this classic power ballad from the acoustic intro to the electric leads. Dave will show you both the acoustic and electric guitar parts in this song. The song begins with a solo acoustic guitar playing a boogie pattern in a blues swing rhythm. After a couple of verses the electric comes crashing in with the rest of the band. There’s a blazing guitar solo by a young Van Halen and a big bluesy ending to close it out. This song is in the key of E and a fast boogie shuffle in 4/4 time at a tempo of about 176 BPM. Dave will show you all the rocking guitar layers in this tune that starts out quiet and sneaky with finger-plucked diads. Eventually it blasts into huge swaggering riffs and dynamic variations from quiet to blasting, all over a deep rocking groove. There’s also a short, but tasty guitar solo. Dave will show you the 3 electric guitar layers in this classic rock tune that uses an iconic arrangement alternating between loud and quiet dynamics. Dave will show you the 2 electric guitar parts in this song that use grungy distorted tones and classic alternating quiet and loud dynamic levels to dramatic effect. Dave will show this Zakk Wylde song that has a laid-back groove with an acoustic guitar for a foundation. The song also features a killer solo loaded with plenty of Zakk-isms like wide vibrato, melodic phrases, and shred speed licks. Dave will show you the guitar parts to this song, from the heavy rhythm guitar riffs, to the blazing lead guitar solo loaded with plenty of Zakk traits like wah-wah, fast finger vibrato, melodic phrases, and lightning speed licks. Dave will show you all the leads & rhythm parts to this classic tune. If some of the material in this lesson is over your head, Guitar Tricks rock courses can help you get up to speed on the techniques and ideas powering these rhythms and solos. Dave will show you this classic early rock and roll dance hit with lots of influence from rockabilly, blues, and big bands. There’s one rhythm guitar that plays through the entire song. There's also a bonus lesson on how to play the sax solo arranged for guitar. Dave will show you the 2 guitar layers in this popular and fun 60s pop rock hit. You’ll play a basic 12 bar blues using a I-IV-V blues progression. As a bonus the sax solo has been arranged for guitar! The song is in the key of G major and 4/4 time at a tempo of about 140 BPM. Dave will show you the single guitar layer in this ‘Made Easy’ arrangement of a popular and fun 60s pop rock hit. You’ll play a basic 12 bar blues using three chords and simple quarter note down strums with the band.